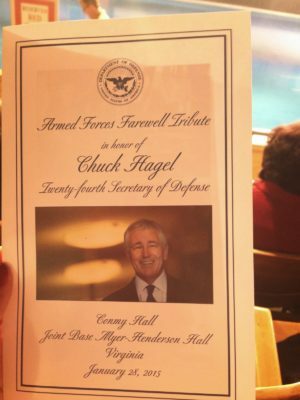 My perspective was recently reinforced when a group of ISH-DC residents received a very special invitation to attend an event honoring Secretary of Defense Chuck Hagel at Fort Myer, the US Army base adjacent to Arlington National Cemetery. Secretary Hagel’s wife, Lilibet, is a member of ISH-DC’s Board of Directors and has helped plan several visits for residents to the Pentagon and the 9/11 Pentagon Memorial. When the invitation was issued, we were told by a member of Secretary Hagel’s staff that we were in for a treat, which I’m pleased to report, was incredibly true. 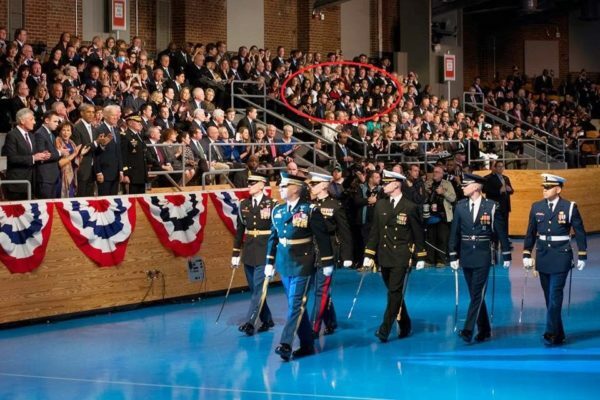 The ISH-DC delegation, which included residents from nearly 20 countries, was seated aside the section reserved for high-level US Government officials and senior members of the US military, as well as members of the Hagel family and their longtime friends. The tribute parade featured music by the US Marine Band, commonly known as the “President’s Own,” and the US Army Old Guard Fife and Drum Corps, which regularly performs at the White House for the welcoming ceremonies for foreign heads of state. The parade included honor guards representing all of the services of the US military. The participation of President Obama and Vice President Biden in the ceremony reinforced how truly fortunate the ISH-DC residents were to be included in such a remarkable event. 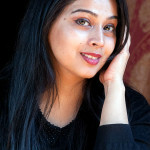 Neena is an engineer turned “global communicator”, it is her wish to promote global citizenship through effective communications across borders. She recently graduated with a Master’s Degree in Communication from Johns Hopkins University, in Washington DC. Before coming to Washington, DC, she lived in Saudi Arabia, India and U.A.E. Neena loves to connect with people with diverse cultures from around the world, making her a large part of the ISH community.